Good morning! Well almost afternoon now. Did everyone sleep in this morning because of the time change last night? I definitely slept a little later than I usually do, even without considering the time change. It’s nice to get caught up on sleep on the weekends and have a lazy morning. I woke up this morning wanting pancakes. My first thought was to make blueberry pancakes because I’ve got a big bag of frozen blueberries in the freezer. I’ve been eating a lot of blueberry pancake oatmeal lately and thought it would be nice to make the real thing this morning. When I finally crawled out of bed (after thinking about making pancakes for the better part of an hour), I pulled out my trusty Betty Crocker Cookbook to find a recipe for blueberry pancakes. I’ve had my red Betty Crocker cookbook for 10 years and it is my best friend in the kitchen. Anytime I have a question about a recipe, I refer to Betty. Benzo and I frequently say “well just ask Betty” when we are trying to figure out how to make something. So I flipped Betty open to the Breads section and right there on page 59 the recipe for Banana-Pecan Pancakes was staring me right in the face. All thoughts of blueberry pancakes went right out of my head. I thought back to some banana-pecan pancakes I had one Sunday a couple months ago at Bob Evans that were extremely good. However they were filled with a creamy pudding and covered in whipped cream and maple pecan sauce. It was a heart attack on a plate and it actually gave me a stomach ache. Now was my chance to make a better version. I made several changes to Betty’s original recipe to come up with the following plant-based, healthier version below. First heat a large skillet over medium heat. 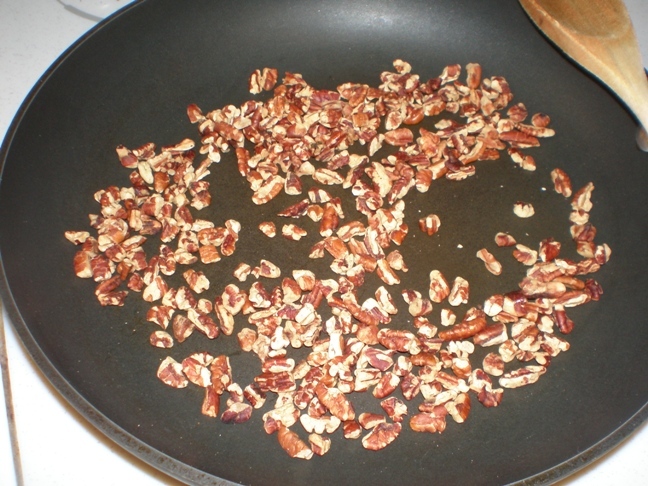 When hot, toast chopped pecans in the dry skillet until they become fragrant. Remove pecans from skillet and set aside in a small bowl. Place skillet back on medium heat. Meanwhile mix flax “egg” in a small bowl and place in the refrigerator. Mix 1 cup soymilk with 1 tbsp white vinegar and set aside to thicken (this buttermilk trick also works with cow’s milk). In a small bowl mash bananas with a fork until few lumps remain. In a large bowl mix together flours, sugar, cinnamon if using, baking powder, baking soda and salt. 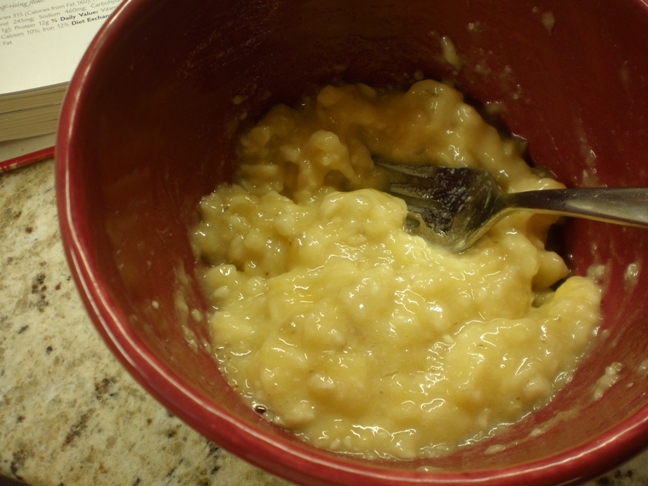 Then add wet ingredients – applesauce, buttermilk, mashed bananas and flax egg. Stir until just combined. Fold in pecans. Test skillet to make sure it is hot by flicking a few drops of water on it with your fingertips. The water droplets should sizzle. 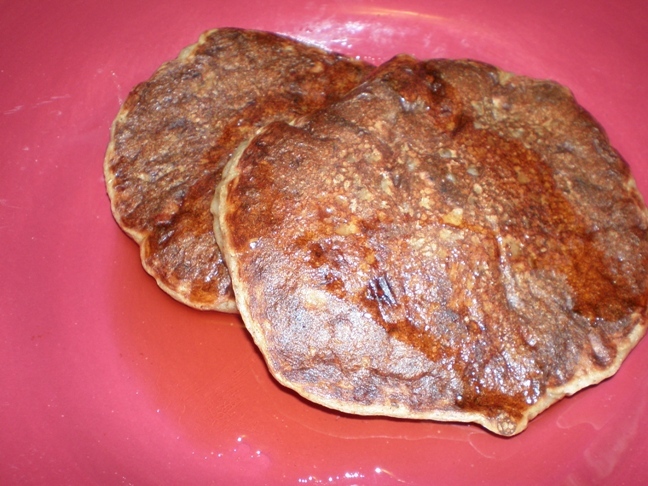 If skillet is hot, begin making pancakes by pouring a scant 1/4 cup of batter onto skillet. Cook until the middle bubbles and the edges look dry. Flip and cook for a minute or two on the other side. Repeat with remaining batter. Makes roughly 12 pancakes. Serve with warm maple syrup. 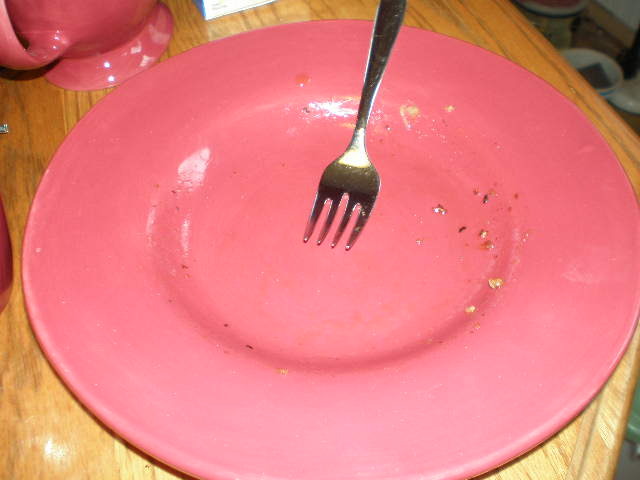 These pancakes were so delicious. They looked like regular pancakes on the outside, but tasted like magic with the gooey banana, toasted pecans and cinnamon on the inside. And these pancakes were not all that unhealthy! I added some whole grains via the whole wheat pastry flour, substituted applesauce for the oil, and used ground flaxseed instead of egg to add in some healthy omega-3s. I also only used 1/8 cup of sugar. A few notes on this recipe: First, the batter was really thick. Next time I might add a few tablespoons of soymilk to thin it out more. Also if you don’t have whole wheat pastry flour, you can use all white flour instead. I like to go half and half with my flours to sneak in some whole grains. I listed the cinnamon as optional because it’s not necessary to make a great-tasting pancake. I really like cinnamon so that’s why I added it. If you don’t like cinnamon, you can leave it out, or use 1/2 tsp or 1/4 tsp instead. Instead of the flax egg you can use any other egg alternative like Ener-G or Bob’s Red Mill, or you can use a real egg. Finally, the mashed banana in the batter makes it seem like the pancakes are not done in the middle at times. That’s just the gooey banana, not the batter so don’t worry. There are so many varieties of pancake out there! This recipe makes me want to experiment even more with different recipes. What pancake ideas would you like to try? I’ve been wanting pancakes, but I’ve been too lazy to make them this weekend. These look delicious!